INDIANAPOLIS (May 8, 2013) — Klipsch, a leading global speaker manufacturer, announces today the launch of its Klipsch Music Center KMC 3, the brand’s first Bluetooth® speaker. The KMC 3 also serves as the initial product offering in the new Klipsch Music Center series. The Klipsch Music Center product line commemorates the brand’s partnership with Live Nation Entertainment and its sponsorship of the Klipsch Music Center amphitheater—one of the five most ticketed live music venues in the world—in its global headquarter city of Indianapolis. Designed to take the concert anywhere, the series of wireless music speakers connect listeners with their favorite artists—minus the crowd. In addition to offering aesthetic appeal with its unique soft-feel paint, semi-gloss accents and jewel-like logos, the apt-X® and AAC Bluetooth-enabled Klipsch Music Center KMC 3 presents a static or portable 2.1 system designed for powerful, accurate sound reproductions. With dual 2-inch, full-range drivers and a dedicated 5.25-inch subwoofer, the KMC 3 produce amazingly detailed output while creating deep, realistic bass. 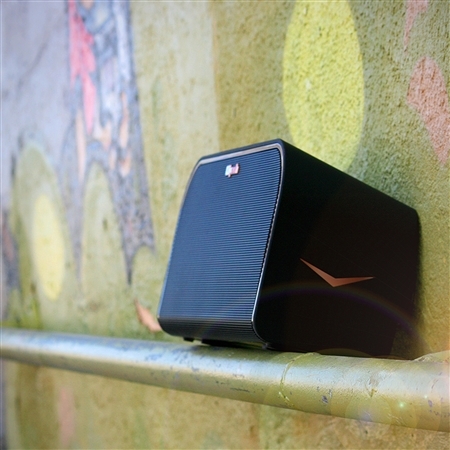 Completing the lifelike music experience is 130 watts of digital power produced by the system. The KMC 3 keeps smartphones and tablets charged via a USB input and plays any non-Bluetooth music source through its 3.5mm input. It also remembers up to eight previously connected Bluetooth devices for quick and painless reconnection. The included remote controls volume and muting, as well as most wirelessly connected music sources while they charge and play simultaneously. Operating on battery power when untethered, the KMC 3 utilizes eight D-cell batteries that allow for up to 26 hours of listening. Available in both a black and white finish, the Klipsch Music Center KMC 3 will retail for $399.99 (U.S. MSRP) and come with a power supply and cord, 3.5mm to 3.5mm 1M cable and remote with battery. The product is available at http://www.klipsch.com and will be available at authorized retailers in June 2013. The Klipsch Music Center Stadium will join the series in summer 2013, with additional systems being added throughout 2013 and 2014. For over 65 years, Klipsch has designed premium speakers for those who are passionate about great sound. Company founder Paul W. Klipsch started this legacy in 1946, and it continues today with sheer commitment to innovation and delivering the world’s most powerful, detailed and emotional sound reproduction. Today, the brand’s diverse product portfolio encompasses home theater, professional cinema, installed whole-house contracting, commercial speakers<, computer speakersiPod® docks and headphones. As one of the first U.S. loudspeaker companies, Klipsch continues to be the high-performance brand of choice for audiophiles and home theater aficionados around the world. Klipsch Group, Inc. is also a wholly-owned subsidiary of VOXX International Corporation (NASDAQ: VOXX).